Whether you’re on a vacation in the Maldives or stopping by the pool after a day at work, a great pair of swim trunks is a must. From wild and patterned prints to traditional and classic designs, we’ve got you covered. No matter if you’re chilling on the sand or you’re ready to play some beach volleyball, these are summer essentials that belong in every man’s wardrobe. 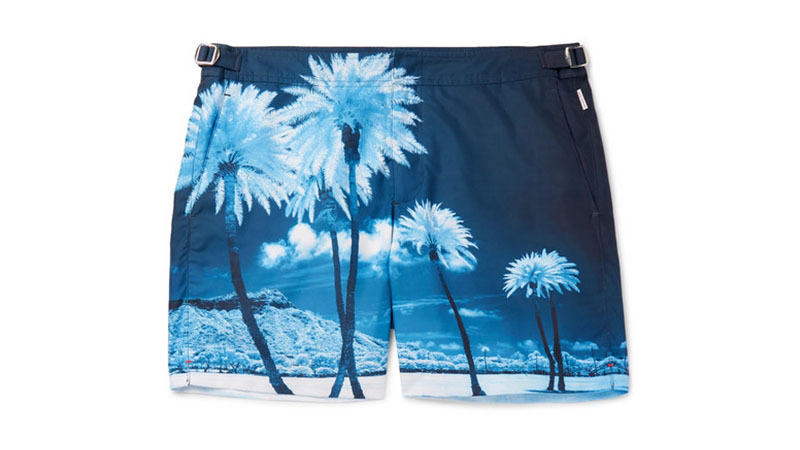 Take a dip in style with these super cool trunks. The cherry-coloured shorts were made to stand out, and the signature “GG” logo is sure to turn a few heads. Made from a comfortable and stylish shell fabric, they dry fast and are perfect for a day out on the beach. With roomy leg length, they allow you to keep it active all day in style. 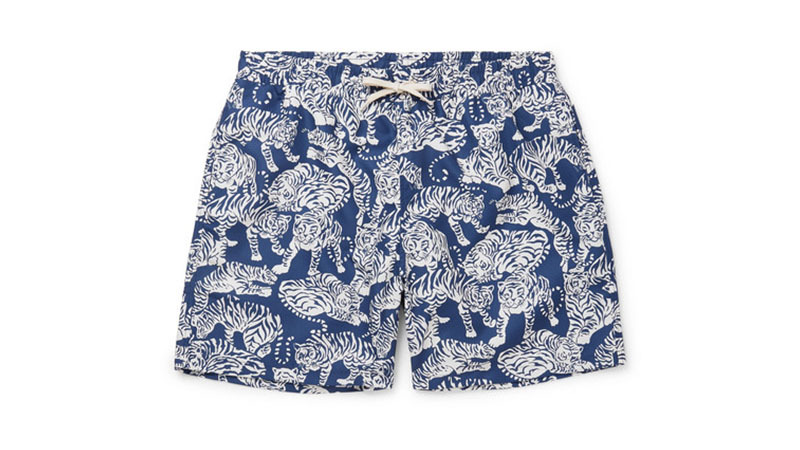 For the man who likes to keep things looking slick, these are the swimming trunks for you. The mid-length shorts offer a clever waistband, allowing you to adjust the tightness to fit you. With a stylish black design, you can work these into any summer ensemble and look like $1 million. Pair these with a t-shirt and sneakers, and you’ll be ready to go from pool-side to courtside in no time. Get stripy in this pair of seersucker shorts. The classic nautical aesthetic will attract a lot of attention, and for all the right reasons. 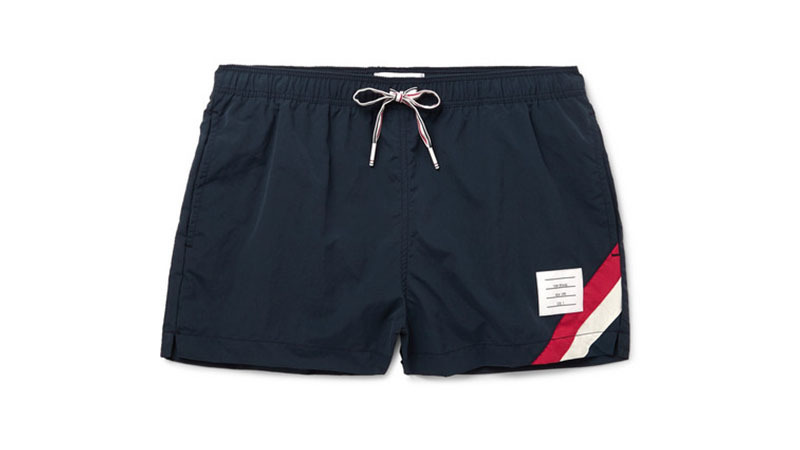 These preppy trunks offer a flattering waistband with the signature Thom Browne tri-colour drawstring and an internal mesh lining, so you have optimal comfort and movement. What more could you want? 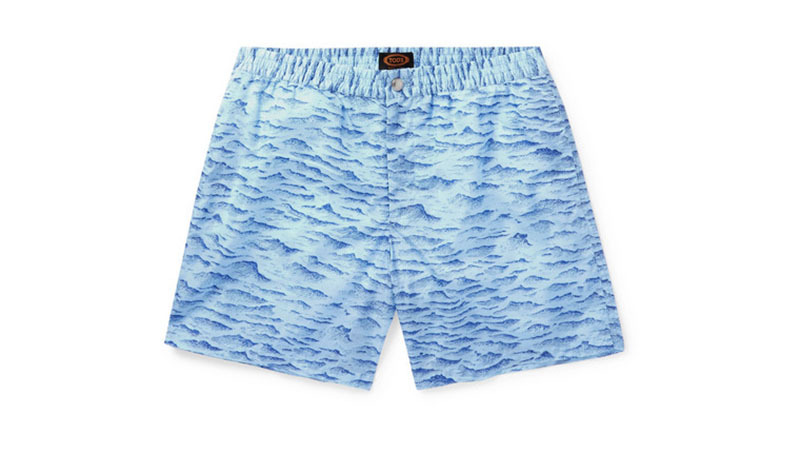 Let yourself hit the waves in this pair of printed shorts. 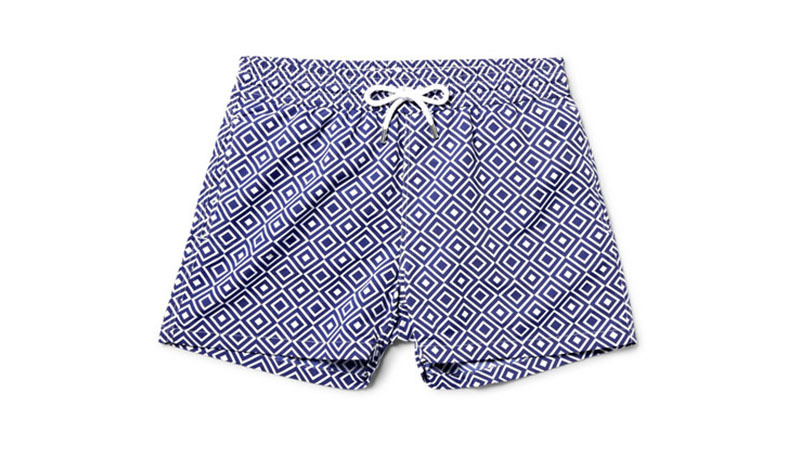 Not only do these trunks look super slick, but they’re also incredibly comfortable so you can wade in them all day. Featuring a sharp print of crashing blue waves and an assortment of internal pockets, you’ll never want to take these bad boys off. Take a dip on your trip with this printed swimwear. 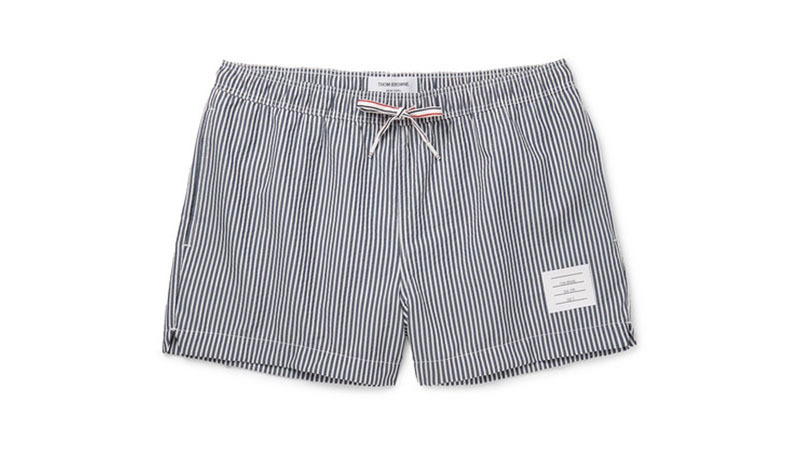 With a slim fit and short length, you can rock these trunks with a linen shirt and some boat shoes for the ultimate beach aesthetic. The ocean-inspired blue and white combination is the perfect pairing for all skin tones and looks great anywhere you go. 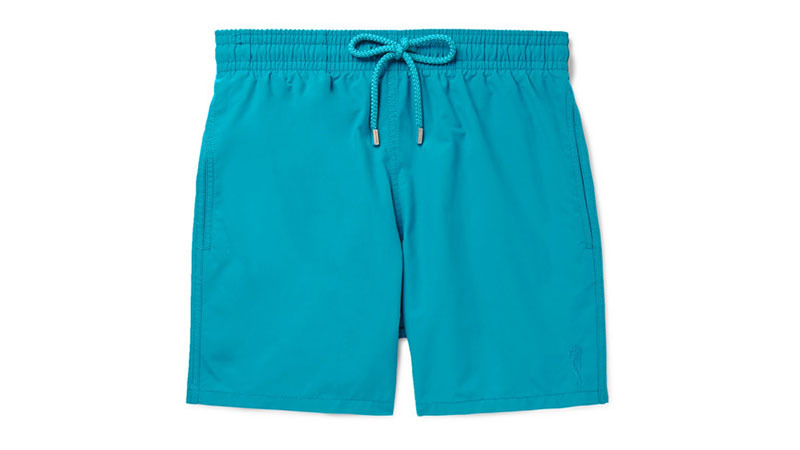 Feel weightless in and out of the waves in these Vilebrequin swim shorts. The ingenious trunks are cut from a quick-dry shell fabric, allowing you to slip them off and wrap them up without worrying about carrying around a pair of wet bathers. 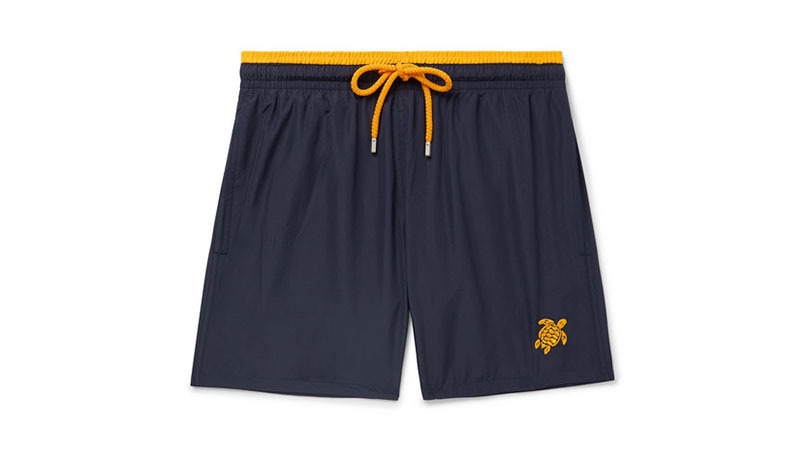 Complete with a small turtle embroidered on the lower leg, these are an essential piece of swimwear for every guy’s closet. When on holiday, why not go all the way with your prints? This feline-themed swimwear is the perfect combination of an edgy and classic design, featuring a cool blue and white colour pairing. The cool shell fabric keeps you dry once you’ve left the water, and the comfortable wide leg ensures that you’ll have enough movement to surf the waves all day. Make a splash in a pair of these teal shorts. The mid-length allows maximum movement and comfort, and the storm-blue with gold are a winning colour combination. This cut goes all the way back to 1971, from Vilebrequin’s legacy design; you can’t get much better than the original. 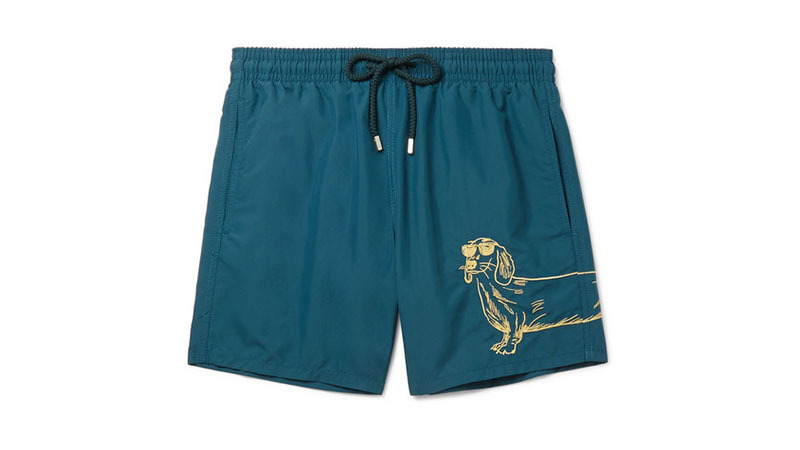 With a quick-dry shell fabric and quirky dachshund printed on the left leg, this pair of trunks is something you can’t miss out on. With shorts these cool, even the fish will be jealous. 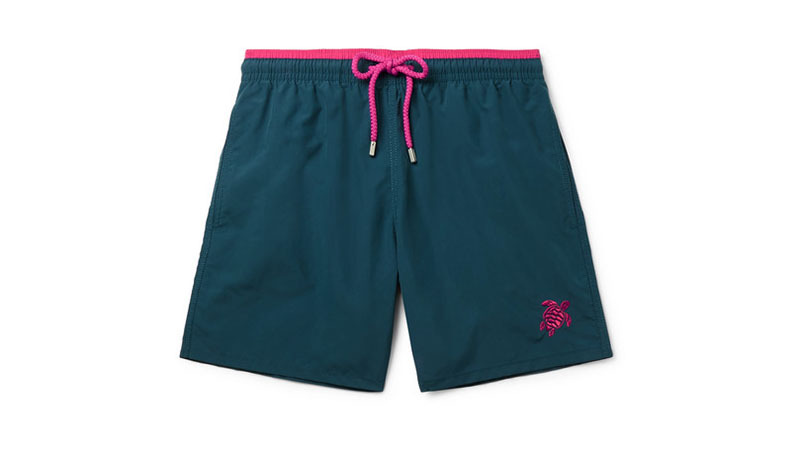 Featuring a contrasting selection of teal and hot pink these trunks look best against both sand and the pavement. Pair this bold essential with a patterned t-shirt for an extra vibrant aesthetic. With a lightweight and easy dry construction, you’ll be hard-pressed finding swimwear as good as this. 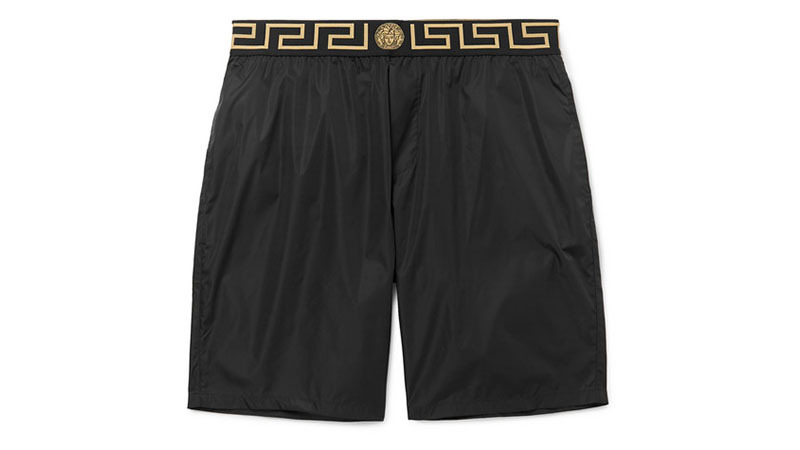 No one does it quite like the Italians, and this Versace swimwear is here to prove just that. Featuring the signature Medusa’s head in the centre and the geometric pattern on the waistband, you’ll feel like you’re worth your weight in gold in a pair of these shorts. The simple style of the trunks offers you the versatility of riding the waves to hitting the streets effortlessly. Stand out, don’t blend in with these Tom Ford swimming trunks. 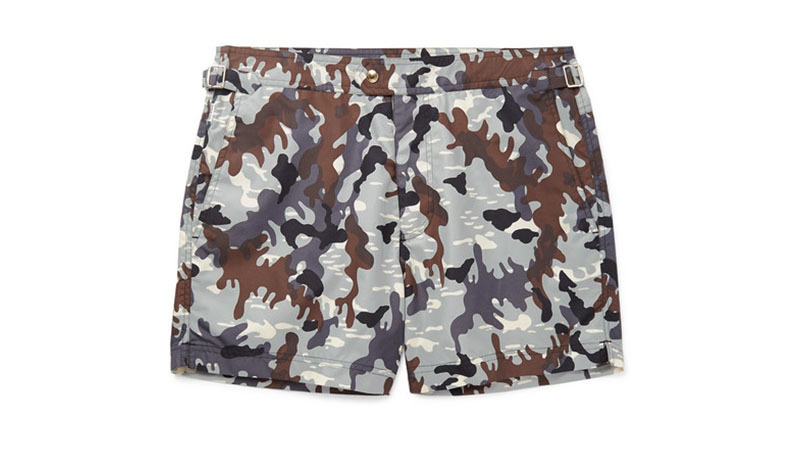 With a distinctive camouflage print and adjustable waistband, this swimwear is sure to attract some attention. The comfortable and breathable mesh support and mid-length shorts make swimming and beach activities a breeze, so you can focus on having boat-loads of fun while looking super slick. 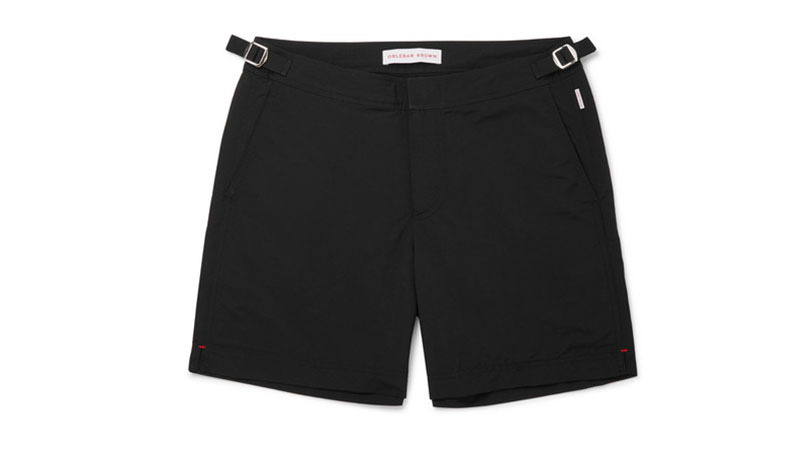 Keep it short and sweet in this pair of Thom Browne trunks. With the signature striped trim, this is the perfect swimwear for those who are ready to show off their well-sculpted pins. The classic navy blue is the perfect finishing touch to any outfit and looks fantastic by the pool or at the volleyball court. The smooth fabric ensures that you’ll be comfortable and stylish while catching the waves. Be bold and bright in this pair of swimming trunks. While they’re simple in design, this swimwear doesn’t skimp on quality. In its robust stitches and timeless ’70s design, you’re sure to be a total knockout in this ensemble. Their pockets feature a small opening, preventing water from filling them, and the drawstring ensures that you’ll have the perfect fit every time. You couldn’t ask for a better pair of shorts even if you tried. 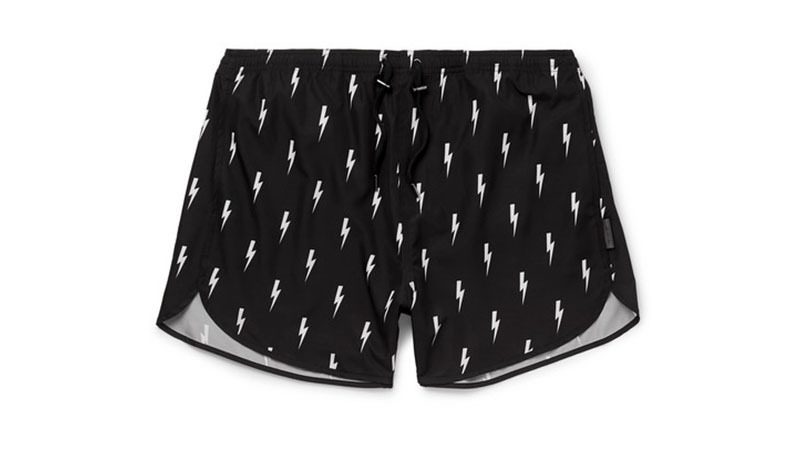 Shine bright and catch the best waves in these Neil Barrett swimming shorts. Featuring a knockout lightning bolt design these trunks have the classic cut, with a slim fit and hidden pockets for a slick feel. Cut from a lightweight shell fabric and with a drawstring waist, you’ll never want to wear any other swimwear! Make a splash and a statement in this pair of beach shorts. Featuring a fun tropical print and classic fit, everyone will want some just like yours. Personalise your fit with the adjustable waistband and set your sights on the water; dive into the deep end with ultimate comfort and style!